Sometimes referred to by its alternative names Cactus Seed Oil and Barbary Fig Seed Oil, Prickly Pear Seed Oil is one of the finest oils available for use on the skin and hair. Morocco’s Sahara Desert is one of the driest climates on the planet, and yet its inhabitants, the Sahrawi people, still manage to maintain supple skin and hydrated hair. How do they stay so moisturised and youthful in such an unforgiving landscape? They utilise the oil from the ubiquitous Prickly Pear Cacti that grow all over the desert. Cacti are one of nature’s rare plants that can stay bright green and lush in even the driest of climates. Due to their unique method of photosynthesis and water storing abilities they can stay healthy in temperatures up to 50°C. The secret lies in the Prickly Pear Cactus’ nutrient-rich oil that runs through and nurtures its entire cellular structure. This oil is found in its highest concentrations in the plant’s seeds, and is abundant in Vitamin E, Sterols and Omega 6 fatty acids. These elements help to protect and nourish your skin, keeping it hydrated and stimulate new cell growth. Best of all, it can also prevent wrinkles and fine lines. How does Prickly Pear Seed Oil compare to Argan Oil? While you have likely heard or Morocco’s other ‘wonder’ oil, few people realise that Prickly Pear Seed Oil is actually packed with more nutrients than Argan Oil. Not only is it loaded with Vitamin E and Omega 6 fatty acids, it is incredibly diverse in its uses. Unlike the heavier Argan Oil, Prickly Pear Seed Oil is light to the touch and absorbs into the skin extremely fast. As it provides a huge amount of moisture to skin cells, it can be used as a Facial Moisturiser, Body and Bath Oil, Moisturising Scrub (when mixed with salt or sugar), Heel Softener, a Hydrating Toner (after cleansing) and as a Cuticle Treatment to soften and heal ragged cuticles. 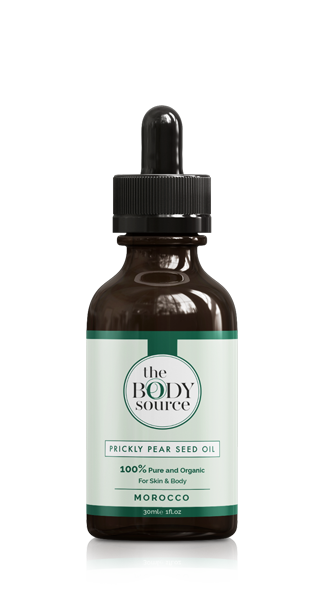 Why does Prickly Pear Seed Oil cost more than other oils? Quite simply, Prickly Pear Seed Oil is rare, luxurious and difficult to extract, elements that combined cause its price to be higher than that of other oils. As an example, it requires more than 300kg of Prickly Pear Cactus fruit to produce one 30ml bottle of our Organic Prickly Pear Seed Oil! Every bottle is filled with cold-pressed oil extracted from the seeds of the Prickly Pear Cactus fruit. It is then bottled at the source in Morocco to make sure that its nutrients stay active and no nourishing elements are lost. The Body Source is committed to ethical practices, and they utilise the labour of trusted Women’s Cooperatives to extract the seeds from the Prickly Pear Cacti fruit. Not only is this the most efficient way to process the oil, it also ensures that the local Berber women receive a fair income for their work.